kill free speech at Freespire.com, a website critical of Robertson. Those of you who have been following Michael Robertson's attacks on free speech, by attempting to take down the Freespire.com website, will be pleased to know he has failed at his last and final attempt. This week, Robertson thew in the towel and abandoned his appeal in the case. Freespire.com, the free-speech gripe site dedicated to exposing the "real" Michael Robertson, can now safely live on for years to come. It is estimated that Robertson spent over $100,000 in his legal attacks to see Freespire.com take down. However, in a previous blog, I had vowed to put my free speech to the test, and see if I could win this appeal without spending one dime on attorney fees, so I represented myself in this matter. I stayed true to my commitment, and am pleased to see that my free speech didn't end up costing me one dime to defend. American's are very fortunate to live in a country where wealthy bullies like Robertson can't buy your free speech for any amount of money. For those of you not familiar with this case...Freespire.com was launched as a means to expose the real Michael Robertson, and as a resource for anyone thinking about having dealings with Robertson. Understandably, Robertson wouldn't want people finding this site. 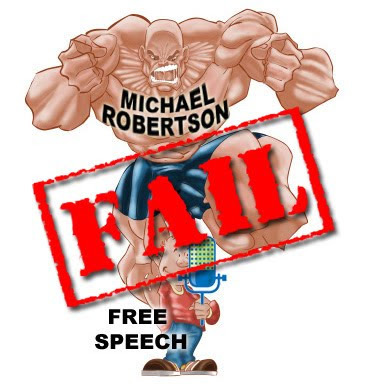 However, given America's strong First Amendment protections of the press and free speech, Robertson was forced to be clever, and tried using Trademark law to have Freespire.com taken down. As I reported in April of last year, Robertson lost those attempts in court after spending thousands in legal bills on his failed attack. Upon losing the case, he filed an appeal, which he has now given up on. I was quite surprised to see Robertson finally make a smart decision and stop wasting money on this. One can only speculate as to why he dropped this case... Is he running out of money? (You know what they say about a fool and his money.) Did he stop paying his lawyers? Did he finally figure out all he was accomplishing was bringing more light to Freespire.com while making his lawyers rich? Did he realize I wasn't spending a dime on this? Did he decide he has bigger things to worry about, like the massive copyright infringement case against him from EMI? My next blog post, "Michael Robertson's Million Dollar Ego," with tabulated figures, facts and details of just how much money Robertson wasted attacking former employees, and see the final "scoreboard" of who won and who lost. Blow by blow accounts of the insurance fraud investigation involving Robertson and his lawyer, Ed Cramp (w/Duane Morris). Updates on Robertson's failure to speak with Linspire shareholders in years since he ran the company into the ground, with millions of dollars still un-accounted for to the shareholders. Timely updates on the EMI copyright infringement case against Robertson. Having worked at MP3.com and closely with Robertson for many years, as well as having been deposed as a witness in the EMI case, I have a unique perspective and access to timely updates for all the developments in that case. For example, find out how Robertson argued that he was involved in all the major decisions at Linspire (where he had little involvement and wasn't the CEO), and yet claimed to have little involvement (read: liability) in the EMI case, where he WAS the CEO of MP3tunes. Don't fall for the spin from Robertson, get the true facts at Freespire.com. Inside perspective from former employees on how Robertson treats them, who he gives special attention to, and who he attacks and his underhanded methods in those attacks. With someone like Robertson, you know there will always be interesting reading, so stay tuned to Freespire.com for the latest news on the REAL Michael Robertson. UPDATE #1: Did Michael Robertson and the Duane Morris Law Firm Commit Insurance Fraud against Chubb? Chubb Insurance out of $100,000? Read the documents, and YOU be the judge. NOTE: As with any personal blog, the opinions expressed here are my own. Each reader should come to their own conclusion, based on the factual documents linked to from this and previous blog posts. In my previous blog post, I disclosed documents which called to light the possibility of insurance fraud having been committed by Michael Robertson and Ed Cramp, who represents Robertson via the law firm Duane Morris. I felt there was enough evidence to suggest the possibility of insurance fraud, that the matter should be investigated. I therefore turned over evidence to The San Diego Police Department, The Department of Insurance for the State of California, and to Chubb Insurance. At the heart of the matter, as I reported in my previous blog, Linspire alleged to Chubb that they were a victim of "theft." In their claim to Chubb, Linspire discussed at great lengths a "police report" they had filed with the San Diego Police department, YET FAILED TO DISCLOSE THE OUTCOME of the police department's investigation. According to the San Diego Police department, Linspire had known for months the outcome, namely, that the San Diego Police Department found NO evidence of ANY theft or criminal wrong doing, and yet Ed Cramp and Linspire failed to disclose this in their claim to Chubb. I mentioned in my blog that I'd keep you updated on the developments of this matter. This is my first update in a series of updates I will be sharing with you, anytime new information comes to light. Since my blog, I have had numerous calls and correspondence with several people from the San Diego Police Department, The Department of Insurance for the State of California, and Chubb Insurance. During our calls, I updated Chubb on the civil case, disclosing to them the full outcome of that civil matter. I warned Chubb that Michael Robertson and Ed Cramp would likely try to use the outcome from the civil case to justify their CRIMINAL claims of THEFT to Chubb. This didn't seem to matter to the Chubb investigator. Because Linspire's claim was for criminal theft, any civil case would likely have little impact on the case. Even if in a civil trial someone was found liable in some way, that wouldn't justify filing a false and deceptive insurance claim saying you were the victim of criminal theft. In fact, should Robertson use the civil case to justify their claim of theft, I believe that would simply open Chubb up to recover any proceeds to recoup the claim. However, Chubb says they always prosecute insurance fraud vigorously, so I'd assume they would be more interested in a criminal prosecution as well as recovering their money. I'll continue to keep you posted as this case evolves via Freespire.com. Now that I know the appropriate departments are investigating, and have good contact information for all involved, I will keep the pressure on to see this matter continues to be investigated fully and report the findings along the way, regardless of the outcome. PS: The civil case where Robertson attacked innocent former Linspire employees is pretty much concluded. Look for my blog summing up the conclusion of that matter next week, "Michael Robertson's Million Dollar Ego," where I disclose exactly how much money Robertson wasted on his attempts to persecute former employees.